I’ve had RA for 11 years, yet I still need to be reminded to be good to my body and not overdo it. Two weeks after the Juvenile Arthritis Conference, feeling more committed to taking better care of myself, I went down to San Diego for the annual monstrosity that is Comic-Con. 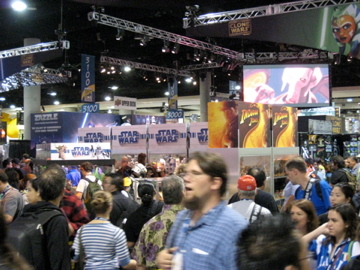 For those of you who have never been, the convention is a gigantic world where comic books, movies, TV, collectibles (and more) collide to create a sensory overload. Trust me. It’s a whole lot of fun, but it means a lot of walking and standing. These lessons may seem obvious, but when you mix Rheumatoid Arthritis with stubbornness… well, you guys understand. Take regular sitting breaks to rest the feet. Don’t forget to take your medicine even if you get back to the hotel room late and just want to crash. Your body worked overtime today and the meds will help you achieve a better tomorrow. It’s okay to wear light colored sneakers (instead of your cute, but uncomfortable open toed heels) with dark jeans and a dressy black top because comfort sometimes must win over style. How do you manage a long day of standing and walking? Leave your suggestions in the comments.